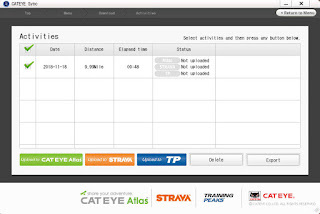 CatEye has been the go-to brand for cycling computers for decades. About six years ago, the finally jumped on the GPS bandwagon with their Stealth line of GPS computers. I tested one out and wrote about my first impressions here. Soon after that, I decided to purchase one of the CatEye Stealth 50 GPS computers for myself. I've been using on all of my bikes for all types of riding, and have been quite pleased with it. The CatEye Stealth 50 comes with a tool-free mounting bracket that works on any handlebar or most stems. Additional mounting kits can be purchased for just $12.99, or an out-front mounting bracket for only $17.99. It also comes with a proprietary charging/sync cradle with USB plug on one end. Setting up the CatEye Stealth 50 is easy. 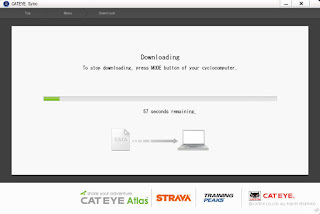 You'll need to download and install the CatEye Sync software on your personal computer (Windows and Mac versions are available). 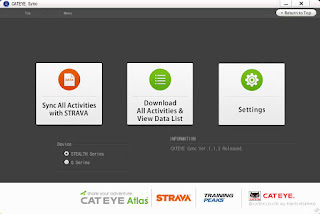 You can create an account on CatEye Atlas for uploading and reviewing your ride data, but since Strava is a more popular ride tracking service, the CatEye Sync software allows you to upload your ride data directly to Strava as well, and you don't need a separate CatEye Atlas account. Once you've got the CatEye Atlas software installed, plus the Stealth 50 into the charging cradle, then plug the USB end into your personal computer. 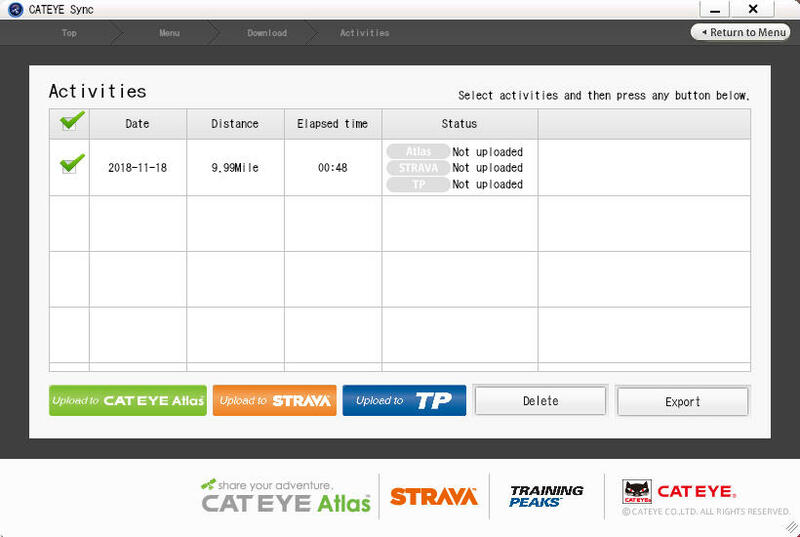 The CatEye Sync software has a quick setup feature that allows you to set some basic options on the Stealth 50, e.g. time zone and preferred units of measurement (miles vs. kilometers). You can also set a specific time of day when the Stealth 50 backlight comes in automatically, to make night-time reading easy. 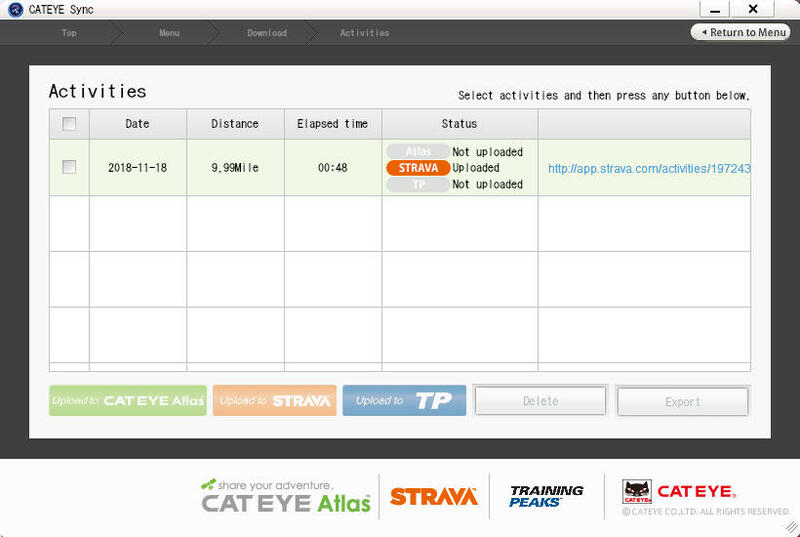 Also, you can set the data recording interval to 1 second, 3 seconds, or 5 seconds. The shorter the recording interval, the more accurate your ride tracking will be, but the trade-off is shorter battery life. However, I have always had mine set to the 1-second data recording interval, and I've never had an issue with the battery running out during a ride, even for long 100-mile days. Once the initial set is done, just clip the Stealth 50 onto your bike, turn it on, wait a few seconds for it to acquire a GPS signal, and ride! Like most basic bike computers, the top line of data on the Stealth 50 shows you your current speed, and the bottom line can be switched to show you ride time, distance, average speed, or maximum speed. The middle line conveniently displays the time of day. The Stealth 50 is compatible with ANT+ sensors, so it will work with most optional speed/cadence sensors, heart rate straps, and power sensors. If I stop for lunch or some other longer break during a ride, I usually turn off the power on the Stealth 50 to save battery life. When I'm ready to start riding again, I just turn it back on, wait a few seconds for it to get the GPS signal again, and it picks up right where it left off. At the end of your ride, you just press and hold the single button on the Stealth 50 to reset and save the ride data. 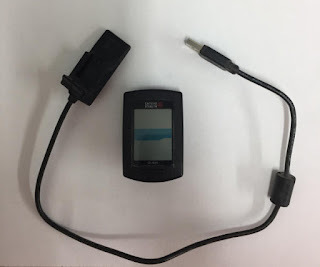 Since the Stealth 50 does not have Bluetooth connectivity like some more recent models of GPS devices, you've got to use the charge/sync cable to view your ride data later. Viewing your ride data is a two-step process once you've plugged the Stealth 50 into your personal computer. 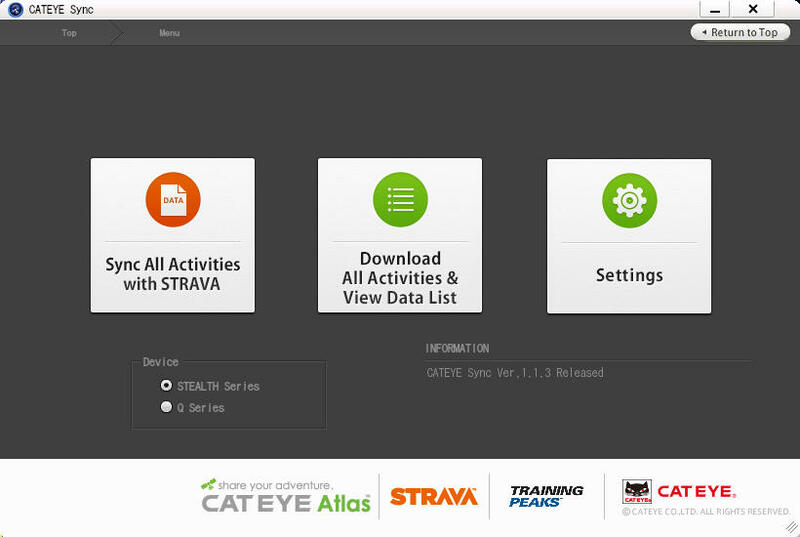 First, your PC has to read the data from the Stealth 50 and download it the PC, then you upload it to CatEye Atlas or Strava. The download step usually takes only a minute or two, and the uploading is even quicker. 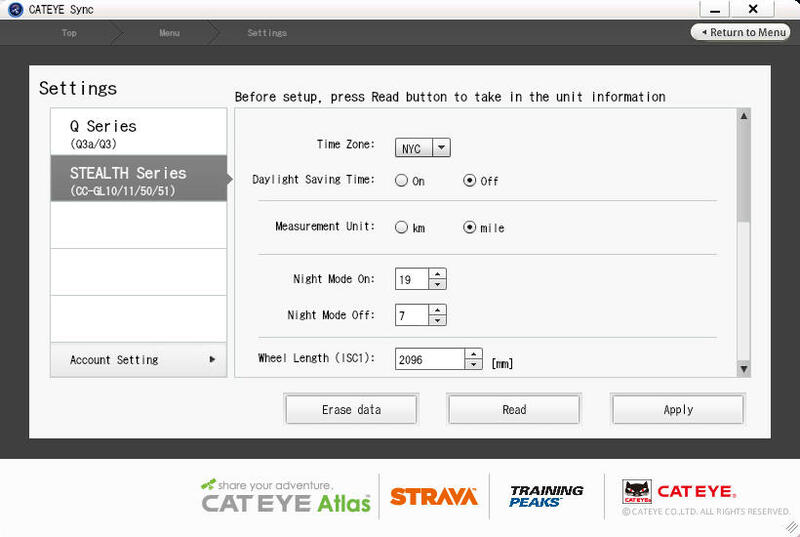 Once the download step is complete, the CatEye Sync program shows you what ride data it found; you can save data from more than one ride at a time on the Stealth 50 unit and download them all at once later. 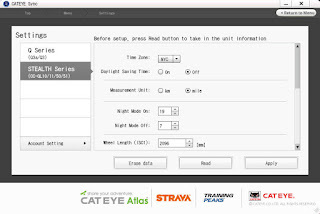 Because of the easy one-button operation of the CatEye Stealth 50, it makes a good device for somebody who just wants a reliable and easy way to see their speed and distance during ride, even if they are not interested in using the GPS tracking features to view their ride data afterwards. Just reset the Stealth 50 at the beginning and end of each ride, and you're good to go, without having to worry about additional sensors and wheel magnets getting knocked out of alignment and other common issues with traditional bike computers. If you use it this way, keep in mind you will eventually have to connect the Stealth 50 to the charge/sync cradle to delete all of the accumulated ride data. This will take much longer than it takes to download just a single ride, possible even an hour or more if there are many rides saved on the device. A full charge takes a couple of hours. When I use it on my commutes to work, I don't bother charging it during the day, as it's got plenty of charge left for my ride home. After long rides, I just plug it in at home, and it's good to go with a full charge the next morning. I've found the CatEye Stealth 50 to be very accurate as far as tracking the distance and route of my rides, when comparing the distance to a traditional cycling computer and a friend's other GPS device when riding with them. I recently acquired an Apple Watch that I use to track rides sometimes, and when I've used both of them at once, found them to track pretty accurately and close to one another when riding on roads and/or bike paths. When mountain biking on singletrack in the woods, I've actually found the CatEye Stealth 50 to be more accurate; I think it keeps the GPS signal more reliably under the tree cover compared to the Apple Watch. 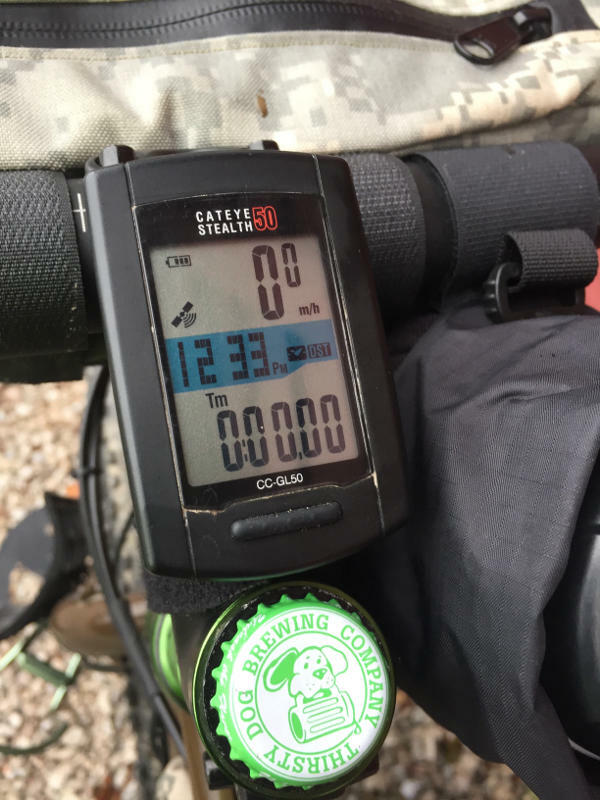 In conclusion, the CatEye Stealth 50 GPS Computer is a good option for somebody looking for a reliable, easy-to-use, and inexpensive device to track their bicycling ride data. CatEye has discontinued making the Stealth 50 GPS, but we've got 2 left in stock at Century Cycles at a special closeout price of $95.99 (originally $149.99)!